Get the job done no matter what. Thanks to a wide range of attachments and a built-in choice of cutting methods a Husqvarna Lawn Tractor offers great usability and becomes a powerful partner in your garden all year round. It’s ideal for efficient lawn care and various tasks on your land. The TS 138 is a user-friendly tractor ideal for homeowners with small to mid-size gardens. It is an efficient tractor with side ejection, smart design and ergonomics. 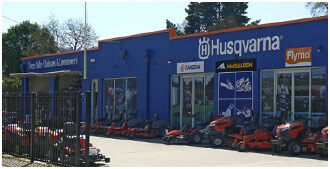 Powered by a Husqvarna Series™ Intek engine with convenient choke-less start and simple pedal-operated transmission. Optional accessories include a collector and mulch (BioClip®) kit for added versatility. The TC 130 is a user-friendly tractor ideal for homeowners having small to mid-size gardens. It is a compact-sized, efficient tractor with integrated collector, smart design and ergonomics. Has a powerful Husqvarna Series engine with choke less start. Easy to manoeuvre thanks to its compact format and pedal-operated hydrostatic transmission. Can be fitted with a BioClip© plug. The TS 246 is ideal for homeowners and landowners with larger gardens who need a durable and comfortable tractor with high manoeuvrability. It is a powerful tractor with side ejection for demanding lawn care. Because the cutting deck ejects clippings, you get maximum capacity even on areas that are cut less frequently. The locking differential transmission gives superior traction in slippery conditions and slopes. Driven by a powerful Kawasaki V-Twin engine. Pedal-operated hydrostatic transmission and cast front axle means easy, trouble-free operation. Collector and BioClip® kit are available as accessories. The TC342 is a high specification machine designed for landowners who need an efficient garden tractor on really large areas all year round. Driven by a powerful Kawasaki V-Twin engine with pedal-operated hydrostatic, fast ground engaging transmission for heavy-duty applications. The large integrated collector ensures a tidy result and the BioClip from seat function quickly switches the cutting system from collection to mulching mode,. Additional features include cruise control, pivoting cast front axle, hour meter with service minder, adjustable sliding seat with arm rests. Rear deflector available as an optional accessory. The TS348 is a high spec garden tractor designed for landowners who need an efficient machine on really large areas all year round. Driven by a powerful Kawasaki FR Series V-Twin engine with pedal-operated hydrostatic transmission and automatic rear differential lock for superior traction and control. The ClearCut™ fabricated deck not only offers rock solid durability but also industry leading performance and cut quality. Additional features include cruise control, pivoting cast front axle, LED headlights, hour meter with service minder, adjustable sliding seat with arm rests. Collector and BioClip® kit are available as optional accessories. The TS 352 is a high spec, high capacity tractor designed for landowners who frequently need an efficient machine on really large areas all year round. It is a powerful tractor with side ejection for demanding lawn care. Fast, ground engaging transmission for heavy duty applications. Pedal-operated hydrostatic transmission, a rugged fabricated deck and cast front axle means convenient and trouble-free operation. Driven by a powerful and robust, Kawasaki, twin cylinder engine.